lost and found: Lost and Found: Second Blogiversary Giveaway! Lost and Found: Second Blogiversary Giveaway! October 1st marks the two year blogiversary of Lost and Found and I’m celebrating with a great big giveaway! This is my way of letting you know how much I appreciate all of you who stop here to visit and inspire me with your comments, good humor, and positive energy. It doesn’t matter if you just clicked here by accident, googled your way over, visit regularly, or fall somewhere in between—I’m so happy you’re here! Now--on to the giveaway! I’ll be the first to admit that my giveaway last year was pretty lame. What can I say? I was new and unprepared and offering up a yet-to-be-created original piece of art might not have been the best idea I’ve ever had. I had 8 participants for the giveaway and I’m grateful to each of them for taking a chance on my mystery prize. This year I’m much better prepared and I hope I can double the number of participants for the giveaway. Of course, I’ll need your help to reach that goal. Since this is the second blogiversary of Lost and Found, I decided to give away TWO original hand-lettered watercolor pieces to TWO lucky readers. All you have to do is leave a comment on this post and tell me which piece you would like and why. I'll make my choices based on your comment--so make it a good one! Be sure I have a way to contact you if you are the winner. First up is this illustrated quote by Howard Thurman. I love this message! This inspirational quote gives us permission to do what we love because doing so is in the best interest of the entire world. What could be better than that? Seriously. The second piece is a happy little doodle of a favorite phrase of mine. No deep thoughts here. This one is just for fun. Both pieces were done with permanent black marker and watercolor and the images measure approximately 6.5 x 8.5 inches which is a bit larger than I usually work. Each one will arrive in a black frame ready to hang on the wall or to display on a flat surface. Here's a peek at how the first one looks framed and hanging on my newly-painted green kitchen wall. Don’t be shy! Jump right in let me know if either of these pieces would brighten up your life, your home, your studio, or your workplace. Leave your comment by midnight on October 1st and I will announce the winners on October 2nd. PS: Congratulations on another anniversary and a great renovation – the new layout is bright and cheery! 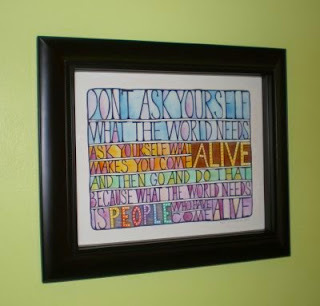 The "come alive" quote was actually part of the "awakening" I went through this summer- my family had an unexpected crisis (my husband lost his job) and I found the quote at exactly the right time. It made me remember EVERYTHING that was important for us me as an individual and also for my little family) and kept things in perspective with the incredibly stressful job hunt. It's just my personal motto now. No matter what- we all need to keep doing the things that are *truly* IMPORTANT to us, keep going after the things that feed our souls. i disagree that 'oh happy day' is 'just for fun.' i see the pop of color and playfulness of the message, but i also see the reminder in it: today is a wonderful day. just this day. today. right now. and i'm the one responsible. appreciate the day. it is truly lovely. this motivates me to see the beauty and joy in reading a story with my little, hearing the rain on the roof, sipping a cup of jasmine tea. today IS a happy day. Congratulations on your second anniversary! I love the Thurman quote and would love it for my office to inspire the kids I work with. Have a great third year. 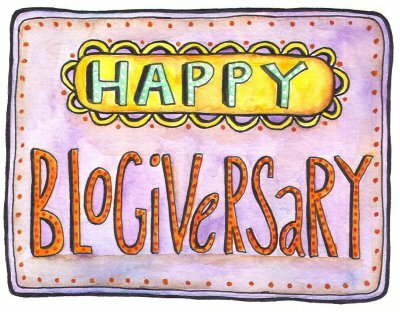 It's great to be able to celebrate this blogiversary with you. 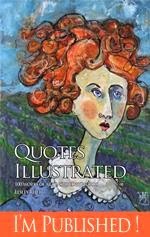 I have been enjoying your illustrations - the wise and witty quotes, the wonderful typography and the warm colours. 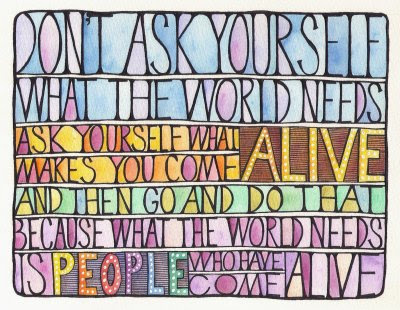 You are certainly someone who has come alive, and inspiring many to do the same. Suggestion: Have your works in a book for more to enjoy. Sorry, my English isn't the best. But it's enough to understand your wonderful messages I'm subscribing to since a few months. I'd really like to have the illustrated quote by Howard Thurman (but of course I also would be so happy with the 'Happy day'). The reason is simple: I have got a blank wall and love your artwork! I love the quote by Howard Thurman, its really quite true. Wow, I'm the 9th commenter which means I've officially broken your first blogiversary record! Sheesh, I can't decide which I like better. 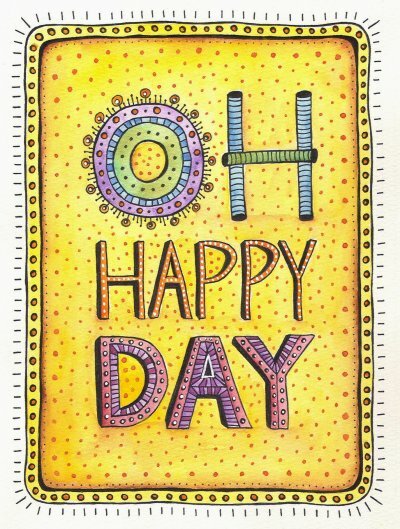 Oh Happy Day would be sooo appropriate for my office space; we have a little attitude problem going on there usually, me included. But I love the other quote...wouldn't that make the world so much a better place if we were all living our dreams and being happy instead of all snarly with each other? Congrats on 2 great years so far!!!!!! I am in LOVE with the Thurman quote. I am pretty much obsessed with quotes. I have a scrapbook full of them that I am always adding too. They are always so inspiring and able to brighten my day. I also love the painting in general along with everything else you do! I also go to EC and each time I go into Kim's room i'm jealous of everything you make her! It's all amazing and you are truly very talented! oh my gosh, that ALIVE piece is just incredible! i love it!! congrats on the milestone!